Repeatedly, critics of Germany’s energy transition say that France’s transition is a better model to follow. A closer look, however, reveals an impressive amount of overlapping. Craig Morris and Arne Jungjohann investigate. Last August, the Wall Street Journal called the Energiewende Germany’s “lonely revolution.” And in January, Deutsche Welle claimed that “Germany stands pretty much alone in its green energy policy – both in Europe and globally.” Often, France is portrayed as a better example to follow. The comparison of Germany and France generally runs along two lines. First, German per capita carbon emissions are roughly 50 percent higher than in France. 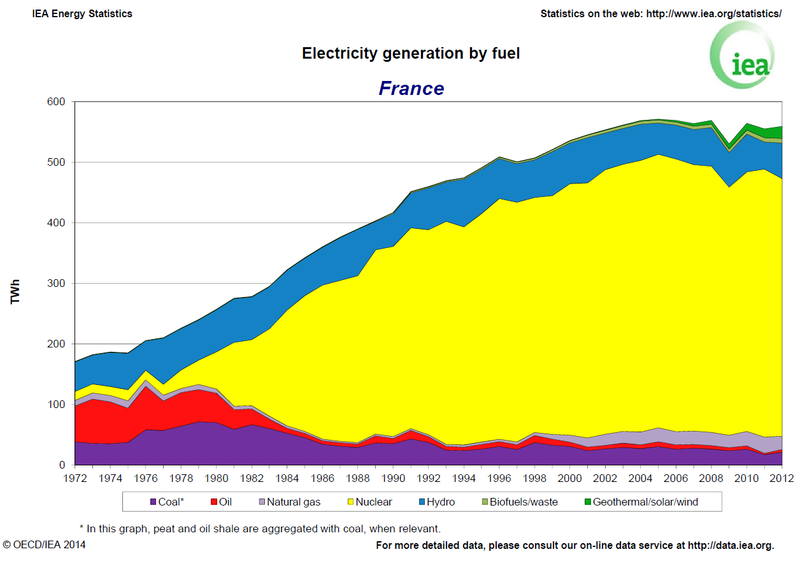 And second, France was able to roll out nuclear much faster than Germany has ramped up renewables. Let’s start with a chart from the International Energy Agency. The French get roughly three quarters of their electricity from nuclear, and they went from a very small share to around 75 percent in around 2 decades starting at a low level in 1977. In comparison, it took Germany around 15 years to increase the share of renewables by 20 percentage points starting in the late 1990s, as the chart below shows. France has a slightly lower GHG target because its current starting point (8.3 t CO2e per capita per year) is well below Germany’s (11t). While France starts with less ambition with renewables in its electricity sector, the overall renewables target in total energy consumption is more ambitious than Germany’s. On energy efficiency, both the long-term and short-term goals are very similar. Even plans for nuclear have an astonishing amount of overlapping. Germany aims to reduce the share of nuclear power from a peak of around 28 percent to zero percent by 2022. France aims to reduce the share of nuclear by 25 percent (from 75 to 50 percent) by 2025. In the process, German will close 17 nuclear plants; France, an estimated 22. So apparently, decades of reliance on nuclear leads to a transition to greater efficiency and renewables, at least in the case of France and Germany. Despite similarities in these goals, France’s approach is considered very different from Germany when it comes to the role of citizens and the public. Pierre Cannet of WWF France says: “democratization or other ways to involve the public in the [French] energy transition is yet to be built”. Others, such as French sociologist and nuclear critic Sezin Topçu, believe that secrecy is the main explanation for the success of nuclear in France, while Germany has produced an admirable level of transparency on the issue (video in French). In our next post, we investigate the unknown history of nuclear in France. Arne Jungjohann is a political scientist, Twitterbrainer and energy expert with a focus on the Energiewende, its politics and communications. This is instructive but a bit short on French energy transition, which is the object of a very ambitious new law. I hope the next post on nuclear power in France is well researched and unambiguous . We in India do not have the full picture of the social and environmental costs of nuclear power in France, though my own readings lead me to believe that it is somewhat like UK I.e. horrible. This is important for India because AREVA is trying to sell expensive reactors to India. Moreover, the newly commissioned reactor at Koodankulam in Tamil Nadu has adversely affected the absorption of wind power into the grid, with the gridco refusing to purchase and pay for existing REpower. Thus, nuclear has replaced RE in Tamil Nadu and this pattern would be disastrous for future RE investments in India.Moreover, it is peculiar that while France is phasing out nuclear power, the US is trying to get India to change its nuclear accident liability law. We live in a sick world where neither truth nor public interest carry any meaning, in the face of commercial and ‘strategic’ interests. I think you’re forgetting something. Most of Germany’s GHG emissions reductions since 1990 are the result of the fact that the Wiedervereinigung was in 1990, and over the next few years, co2 belching inefficient Soviet era heavy East German industry was shut down and the East was modernized. The German per capita co2 equivalent emissions path shows that quite clearly. Once East Germany was modernized, German per capita emissions reductions slowed right down. From 1990 to 1992, German per capita emissions fell by more than they fell from 2000 to 2012. Meanwhile, since the start of the Energiewende in 2000, French co2 equivalent emissions have fallen faster than Germany’s, both in absolute terms, and in proportional terms. Focusing as you do on percent changes since 1990 also ignores the fact that French emissions were already significantly lower than German emissions. It’s sneaky to use 1990 as the starting year for Germany when evaluating the success of the Energiewende at reducing GHG emissions. Using 1990 as the starting data conveniently lets Germany start the clock in the same year it could begin putting the dirty DDR’s pollution on its books. Without showing the numbers that illustrate the pathway GHG emissions have taken, you invite readers to conclude the Energiewende had something to do with those reductions, when in reality it played no such role. The numbers make it hard to conclude the Energiewende has had any discernable impact on German GHG emissions, especially when they’re placed in international comparison (France provides one such example, but there are many others). German per capita emissions fell by ~3 tons per person from 1990 to 1999. They then, during the Energiewende era, fell by only a ton from 2000 to 2012, despite favorable tailwinds provided by the largest recession since the Great Depression and the relatively stagnant economy that has followed since. To Summarize: Germany – Energiewende in 2000, per capita emissions fall over 12 years by ~1 ton. France – No Energiewende. Per capita emissions (which are already much lower than Germany’s) from 2000 to 2012 fall by about ~1.7 tons. Now you say France is on a similar path regarding a nuclear phase-out. Well, there is a common thread. The “Green” political party in both nations has managed to gain outsized influence and in France they have been able to some extent to push for the implementation of their typical brand of emotionally/ideologically based, scientifically illiterate, environmentally destructive and economically damaging policies. I doubt very much though if the French will actually make these nuclear reductions, but if they do, it will represent a big step backwards in the effort to rein in global warming. Andrew, you state that most of German CO2 reductions came from reunification, but the official figure is 10 percent – out of 27 percent as of last year: http://www.renewablesinternational.net/fixing-german-carbon-emissions/150/537/83739/. Also, you state that the Energiewende began in 2000, but there is no official starting date. The law passed in 2000 was an update of the law from 1991, and the term itself was coined in the 1970s. Your comment hardly indicates adequate understanding of the cost externalizations used by nuclear advocates in their calculations. The costs of any unit of nuclear and its waste disposal, along with insurance against catastrophic dangers is the great dirty secret you ignore and downplay. That dirty secret of Frency centralized control certainly appears sensible as far as it goes in managing such an expensive, complex, and dangerous technology as nuclear. Of course, that question of citizen and democratic enterprise is crucial, just as in the US where Big Corporate monopoly is key to understanding the fossil fuel industry and the power of its anti-enviornmental, not just anti-Climate Change, propaganda. I am just now trying to refresh my memory of the name of the pioneering French RE co-op. The good news is that it is part of an RE co-op network throughout Europe, not just in the pioneers Denmark and Germany. Spain, too, is noteworthy for its pioneer RE co-op. Previous PostHow is Germany integrating and balancing renewable energy today?